I have die cut two circles to frame this design. The outer circle is in pink gingham and the inner circle is white card. To this I have added the balloon design which I have die cut from pink textured card. The four balloons spell out BABY and the bow tying them together is embellished with a clear acrylic gemstone. 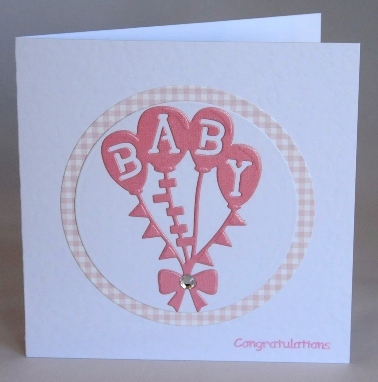 The card is finished with the word Congratulations in pink lettering. The card is blank inside for your own message of welcome. The card is also available in blue (with blue lettering) – please tell me at the checkout which colour you want. If ordering by phone, please reference card #772.